1934 – LT Akers demonstrates blind landing system at College Park, MD in OJ-2 aircraft. 1942 – Battle of Coral Sea, first carrier vs. carrier battle, begins. 1942 – Carrier aircraft sink Japanese carrier Shoho during Battle of Coral Sea. 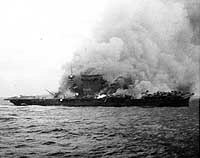 1945 – Japanese attempt to land on Okinawa repulsed; kamikaze attacks damage 6 U.S. Navy ships. 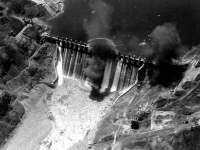 1951 – USS Princeton aircraft attack Hwachon Dam using aerial torpedoes, only use of this weapon in Korean War. 1961 – Pilot CDR Malcolm D. Ross, USNR, and medical observer LCDR Victor A. Prather, Jr., ascended in two hours to over 110,00 feet in Strato-Lab 5, a 411-foot hydrogen filled balloon launched from from the deck of USS Antietam. This was the highest altitude attained by man in an open gondola. Tragically, Prather drowned during the recovery. 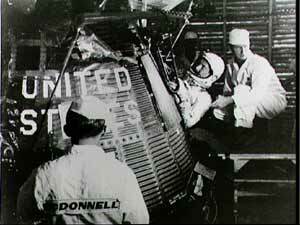 1961 – CDR Alan Shepard Jr. makes first U.S. manned space flight. Flight of Freedom 7 (Mercury 3) which lasted 15 minutes and 28 seconds reached the altitude of 116.5 statute miles with a velocity of 5,134 mph. Recovery was by HUS1 helicopter of HMR(L)-262 from USS Lake Champlain (CVS-39). 1911 – Navy ordered its first airplane, Curtiss A-1, Birthday of Naval Aviation. 1926 – LCDR Richard Byrd and Chief Machinist Mate Floyd Bennett make first flight over North Pole; both receive Congressional Medal of Honor. 1942 – First Naval Air Transport Service flight across Pacific. 1942 – Battle of the Coral Sea ends with Japanese retiring from area. 1942 – USS Wasp in Mediterranean launches 47 Spitfire aircraft to help defend Malta. 1945 – VE – Day, Germany’s unconditional surrender to the Allies. 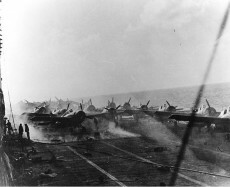 1945 – Aircraft from fast carrier task force begin 2-day attack on Kyushu airfields, Japan. 1964 – Organization and deployment of world’s first all nuclear-powered task group, USS Enterprise, USS Long Beach, and USS Bainbridge, to Sixth Fleet. 1919 – Three Navy flying boats begin 1st trans-Atlantic flight from Newfoundland. 1951 – Aircraft from carriers attack bridges between Wonsan and Hamhung, Korea. 1958 – Naval aircraft F4D-1 Sky Ray sets five world speed-to-climb records, 22-23 May. 1962 – Launch of Aurora 7 (Mercury 7), piloted by LCDR Malcolm Scott Carpenter, USN, who completed 3 orbits in 4 hours, 56 minutes at an altitude up to 166.8 statute miles at 17,549 mph. He was picked up by HSS-2 helicopters from USS Intrepid (CVS-11). The capsule was recovered by USS John R. Pierce (DD-753). 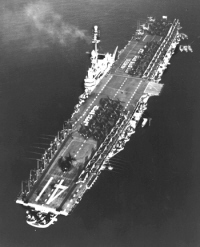 1964 – The initiation of the standing carrier presence at Yankee Station in the South China Sea. 1969 – Launch of Apollo 10, dress rehearsal for first lunar landing mission. CDR John W. Young, USN, was the Command Module Pilot and CDR Eugene A. Cernan, USN, was the Lunar Module Pilot. During the 8 Day mission, the craft made 31 lunar orbits in 61.6 hours. Recovery was by HS-4 helicopters from USS Princeton (LPH-5). 1919 – Navy NC-4 completes trans-Atlantic flight from Newfoundland to Lisbon, Portugal. NC-4’s transatlantic flight ends at Plymouth, England . 1945 – Fast carrier task force aircraft attack airfields in southern Kyushu, Japan. 1952 – Tests from 26-29 May demonstrate feasibility of the angled-deck concept conducted on simulated angled deck on USS Midway. Flight of Freedom 7 & CDR Alan Shepard Jr.